Previously, I wrote about how to preserve acidic foods at home, which can save both money and your peace of mind, knowing exactly what is going into your foods. The same goes for non-acidic foods; I want to know what I’m eating, not just because it might have too much fructose in it. Acidic foods, like tomatoes and raspberries, have the advantage in that their acidity provides an innate defense against bacterial growth. Non-acidic foods, like capsicums, green beans and carrots, do not have this luxury. You will need a pressure-canner to properly process these, as only by pressurising the chamber the jars are processed in can you reliably heat the contents enough to thoroughly kill off any bacteria that might be present – the temperature needs to reach 116 C/240 F.
Jar tongs, tongs, wrench, magnet, spatula with incremental measurements, wide-mouthed funnel. Place the lids in a separate saucepan, bring to the boil then reduce to a simmer. This will both sterilise them and soften the sealant that is around the rim. If you are using store bought canning jars that come with lids and rings, you only need to sterilise the lids, not the rings. 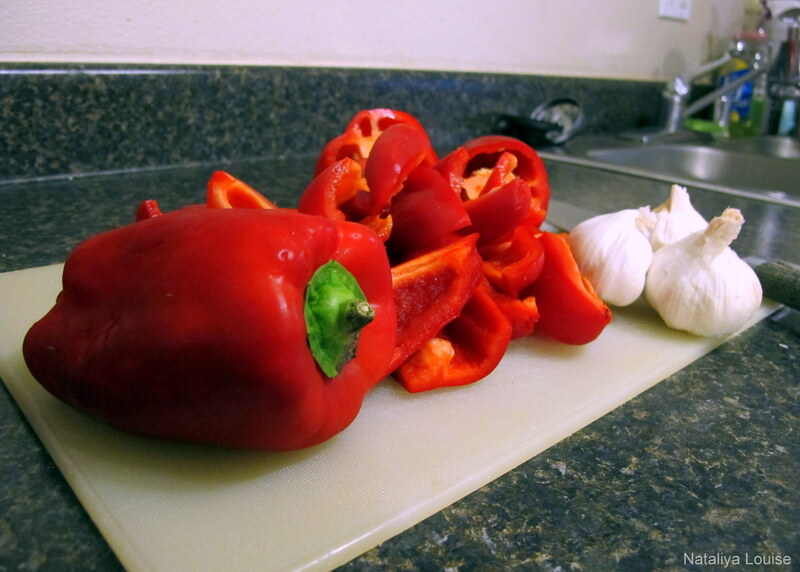 Prepare your filling; examples include relishes, chutneys, or blanched vegetables. Make sure you keep it hot, unless you are raw-packing, of course. 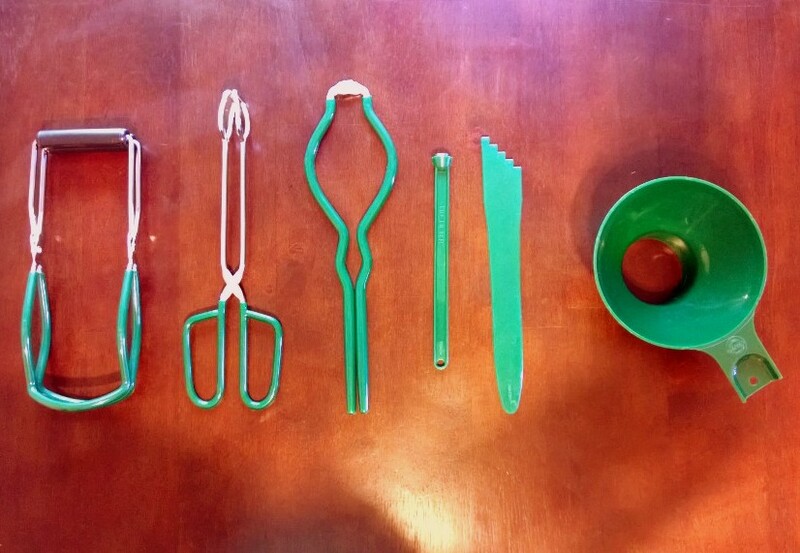 Using the jar tongs or gripper to manipulate the hot glassware, remove each jar from the boiling water and empty it. 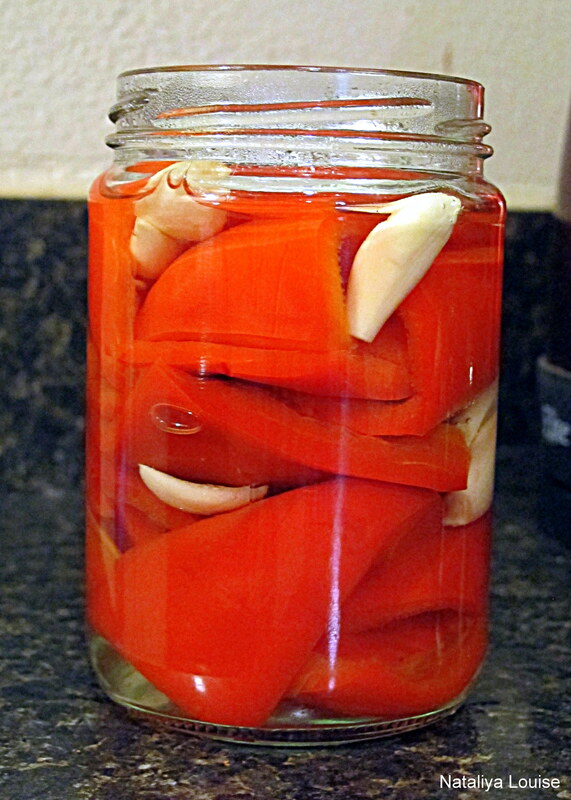 Fill each jar using the wide-mouthed funnel (if necessary), leaving 2 cm between the filling and the mouth of the jar. Sterilise the spatula for 2 minutes in boiling water, then use it to remove any air bubbles from the jars by scraping the inside edges. 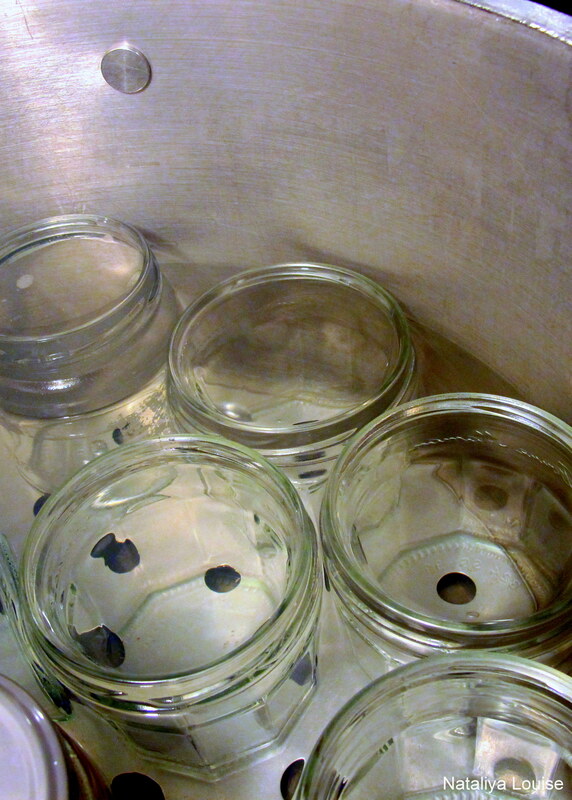 Replace all the jars into the pressure canner, on top of the stand to keep them raised off the base of the pot. 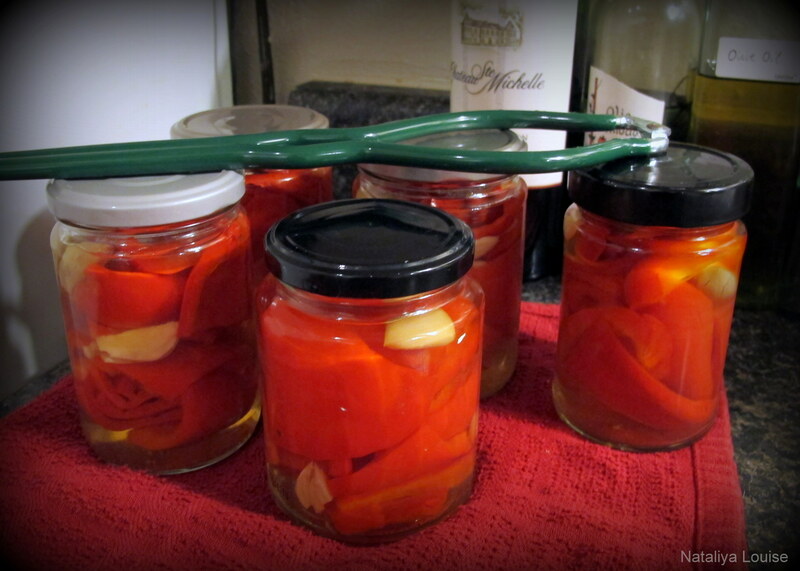 The jars should not be submerged – the water should be sitting between half and three-quarters of the way up the jar. 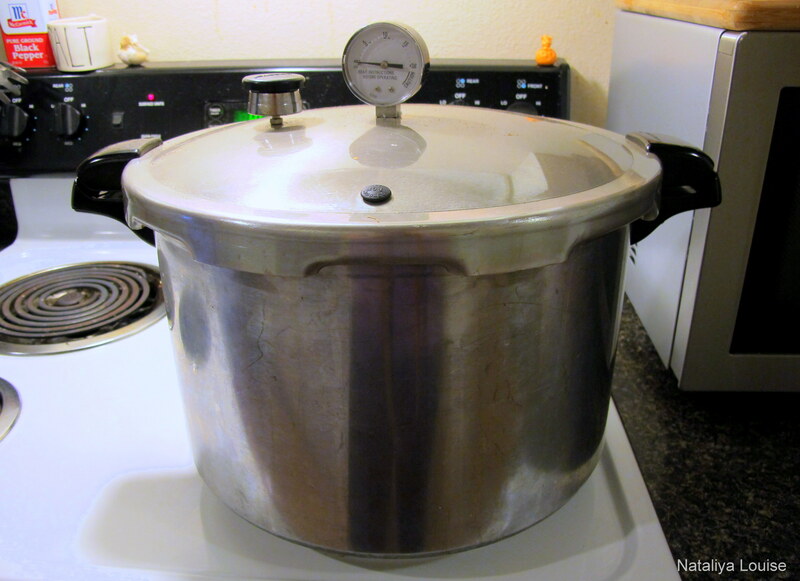 Bring the water in the pressure canner to the boil and fasten the lid; let it boil for 10 minutes. Place on the weight to gauge the pressure at 10 psi (for those living close to sea level. Higher altitudes will require higher pressures of 1/2 a pound per 1000 ft/300 m, as listed here). 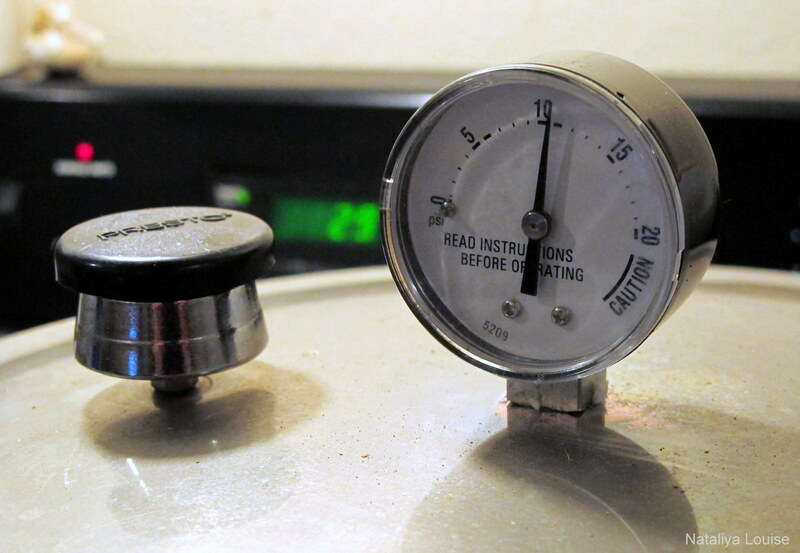 Once the pressure inside the canner has reached 10 psi (or whatever the recipe/your altitude calls for) start your timer and begin processing. A standard amount is to process for 30-35 minutes but this can change for certain foods. Follow your recipe. Once the time is up, turn off the heat and let the pressure reduce slowly. DO NOT OPEN THE LID OR REMOVE THE WEIGHT until the pressure inside is equal to outside. This sudden loss of pressure could cause the glass jars to break, let alone be dangerous for you or any bystanders. 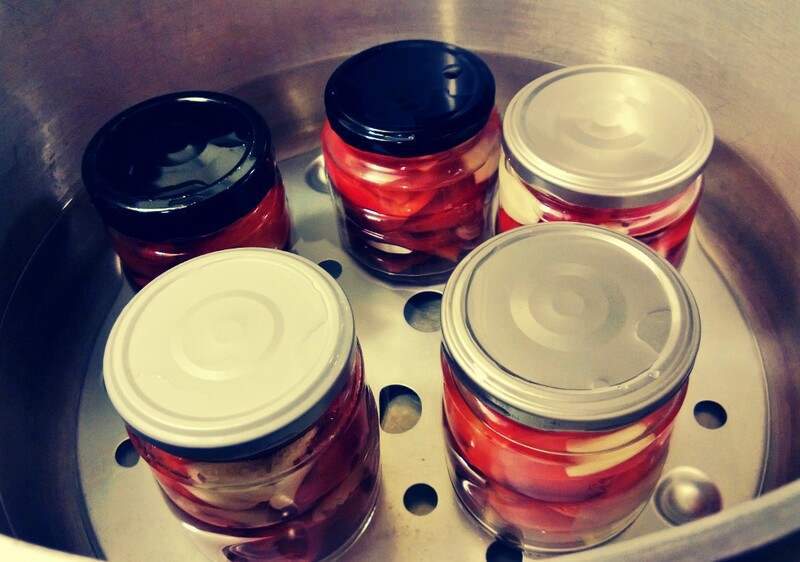 Remove the lid and let the water continue to cool for 10 minutes before removing the jars with the jar tongs and letting them cool on a rack for 12 hours at least. Then test the seals with a magnet the next day. If any pop up, they are not sealed. Either re-process them with new lids or freeze/refrigerate immediately. Weight gauge – a different weight for each pressure required, so put on the weight for 10 psi. Dial gauge – a single weight only, with a pressure dial to read the psi inside. Manipulate the pressure by adjusting the stove top temperature. This is the type I have, not as accurate as a weight gauge but I haven’t had any issues. This entry was posted in Breakfast, Entrees, Appetisers and Sides, Not A Recipe, Sauces & Dips, Savoury Preserves, Tips and Tricks and tagged all natural, canning, dinner, entree, food, fructose friendly, fructose malabsorption, gluten free, healthy, home-cooked, homemade, jam, jelly, low fat, low fructose, no additives, preserves, pressure canning, spreads, vegetarian. Bookmark the permalink. I was searching for converting dial canner to weighted canner when I found your post. I don’t think I’ve ever seen lids like that for home canning. Where do you get them? Hi Marti, I’m currently living in Seattle and I can buy them at the local supermarket. I did see them at Chadstone Shopping Centre in Melbourne, Aus in a home goods store but I can’t remember its name, sorry. Also, if you search “canning jars” on Amazon them they have plenty of options there: http://www.amazon.com/s/ref=nb_sb_ss_c_0_7?url=search-alias%3Dgarden&field-keywords=canning+jars&sprefix=canning%2Caps%2C198 Good luck!